In the world of political blogging, the President’s speech before a joint session of Congress (basically a state of the union speech) is already ancient history, but I thought this was interesting enough to post. I’ve mused before on how word clouds and tag clouds can be useful – here’s a nice qualitative example. 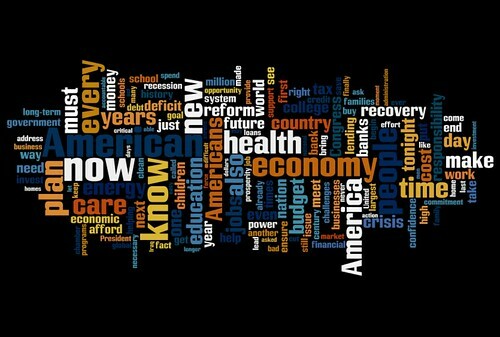 Here’s a word cloud of President Barack Obama’s speech – major themes are apparent in large type, such as “economy” and “health.” You can also tell something about the urgency of the speech, with words like “now,” “new,” and “plan” showing up rather prominently. Contrast with Louisiana Governor Bobby Jindal’s response, seen below. 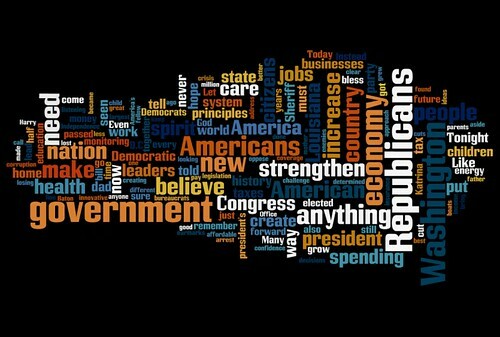 The three most dominant words are “Republicans”, which is understandable, “government” and “Washington.” I think this illustrates pretty clearly the thrust of Jindal’s speech, that the federal government can’t do anything right. This isn’t a political blog but I do want to give a quick shout out to all the geologists out there who do important work like monitoring volcanoes. It’s ridiculous that Jindal, running a state that lives and dies based on natural disaster monitoring, would call out volcano monitoring as his example of pork spending. Both word clouds made at Wordle.